Social media tools such as Facebook are an excellent way to drive traffic to a product or service you offer. The effect Facebook pages have had has been further heightened with the introduction of Facebook Timelines and custom Facebook Pages. Users can create custom Facebook Pages to display information / images about a specific product or service they offer. The information displayed can either act as a direct method of advertising or simply refer the user to more information on the topic such as a website. The ease at which information spreads across Facebook makes custom pages a must for any serious business. There are a number of tools available to assist users in making custom Facebook Pages. These tools range from building your entire custom page in a pre made template and simply filling in the blanks and slightly customising the page for your business or entity to creating completely custom unique Facebook pages with your own code and designs. At Bytewire, website designers in Essex, we recently used Pagemodo as our tool of choice for making speedy custom Facebook pages. Pagemodo caters for all levels of user by boasting a user friendly interface and excellent templates to create custom Facebook Pages without the need for expert website design knowledge. Whilst also offering the flexibility for more advanced users allowing the creation of custom designed Facebook Pages. The introduction of Pagemodo’s iFrame feature gives the ability to create fully custom Facebook Pages using your own designs and markup in the same way you would create a normal website. Using the iFrame method makes creating a custom Facebook Page no different to creating a normal website. It can have the same functionality of a website including galleries, sliders, contact forms, products and even videos. The first step is to create your Facebook Page ensuring you stick to the maximum width of 810px. When complete sign up to Pagemodo and login to your Facebook account which must be an Administrator of the Facebook Page you are creating the custom page for. Then simply create a new tab and enter the URL of the page you have just created. This will automatically display the page you created within an iFrame on your Facebook Page. You can see the custom Facebook Page we have created for Bytewire here. Want a custom Facebook Page for your Business? 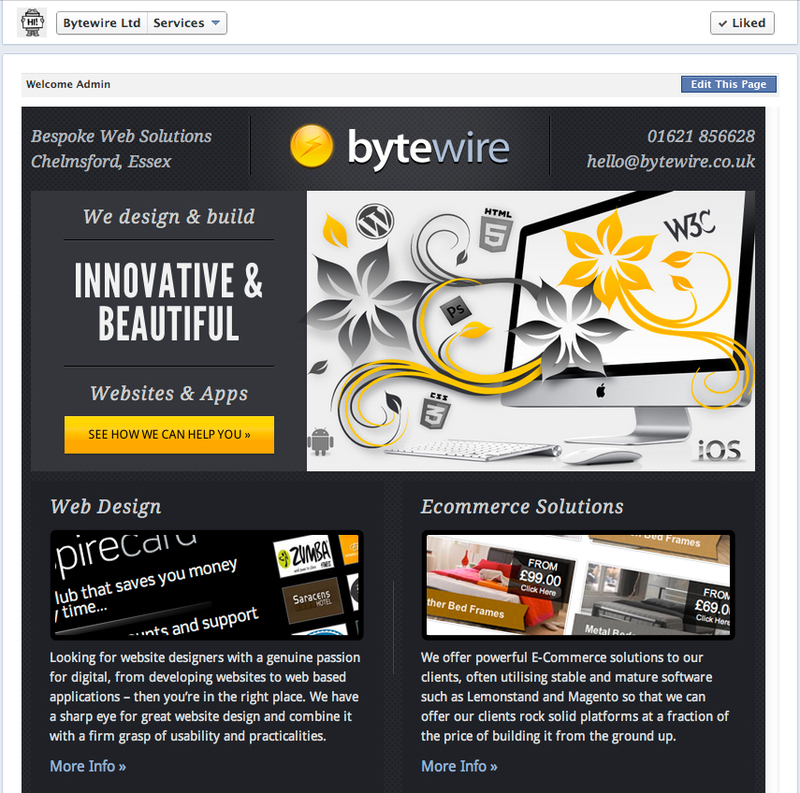 If you like the custom Facebook Page we created for Bytewire or would like more information on creating a custom Facebook Page for your business call us on 01621 856628 or email hello@bytewire.co.uk.